S = SORT Identify what’s important to you and group similar items together. For example, if you were doing a whole room the categories could be things like clothes, books, photos, and papers. If sorting an individual category such as clothes, break it down further – pants, shirts, dresses, shoes. P = PURGE Decide what you can live without and get rid of it. For EACH item ask yourself, “Do I use this? Do I love it? Is it in good condition? How many of these do I have, and how many do I really need?” KEEP the items you love and use (or wear), and put the rest in piles labeled TOSS, DONATE, and UNDECIDED (use this category only if your indecision is slowing down the process). Put the TOSS pile directly into the trash; call a charity for DONATION pick-up. Put the UNDECIDED pile into a garbage bag or box, date it, and take it out to the garage (or other storage area). If you miss an item from that pile, go ahead and retrieve it. However, if six months go by and you have forgotten what’s in there, don’t sort through it again, just toss or donate it. A = ASSIGN A HOME Decide where the items you KEEP will “live”. Remember to make it logical, accessible, and safe. “A place for everything, and everything in its place.” The trick is to choose an appropriate “home” for each item, or group of items. Store items you use all the time near where you use them. Store infrequently used items up high, or out in the garage (or other storage area). C = CONTAINERIZE Make sure containers are sturdy, easy to handle, the right size, and that they look good in the room. The art of containerizing is to do it last, not first. That means don’t buy any new containers until you see what you have left after sorting and purging, assigning a home, and measuring your space. Then you’ll know what size and style to get. You may be surprised to find that you already have everything you need! E = EQUALIZE This means a few things: 1) Put your stuff away! Spend 15 minutes a day to maintain your new system. This will be a lot easier to do once everything has a “home” that is appropriate in size, style and location. 2) Practice the One In, One Out Rule: If you buy something new, like a pair of shoes, get rid of an old pair. This way you don’t outgrow your shoe rack and create more clutter on the floor of your closet. 3) Periodically re-evaluate your system to see how it is working for you. Tweak as necessary. Do you think this would work for you? Please share in the comments below! Copyright 2006-2015 by Hazel Thornton, Organized For Life. Julie’s book changed my life. I read it after seeing her on Oprah in 1998. I applied her SPACE system to my tupperware cabinet and for the first time it actually stayed organized. 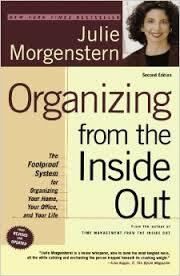 Within 2 years of reading that book I launched my own organizing business. I love the way you summed up the containerizing point. “The art of containerizing is to do it last, not first.” It really is an art. Hi Karen, that’s when I read it too. But I was also in the midst of my corporate career. It didn’t occur to me until several months BEFORE I was laid off in 2004 that I, too, could be a professional organizer! I attended a NAPO-LA conference that year (before I was a member or had been laid off) just to hear Julie speak!